Eleyna Lopez, far right, celebrates her first place spot as Edinburg CISD Culinary Arts students compete in the Cupcake Wars contest as part of the Career and Technical Education (CTE) Summer Enrichment Program in the Career Center Building at Barrientes Middle SchoolJune 21, 2017 in Pharr. 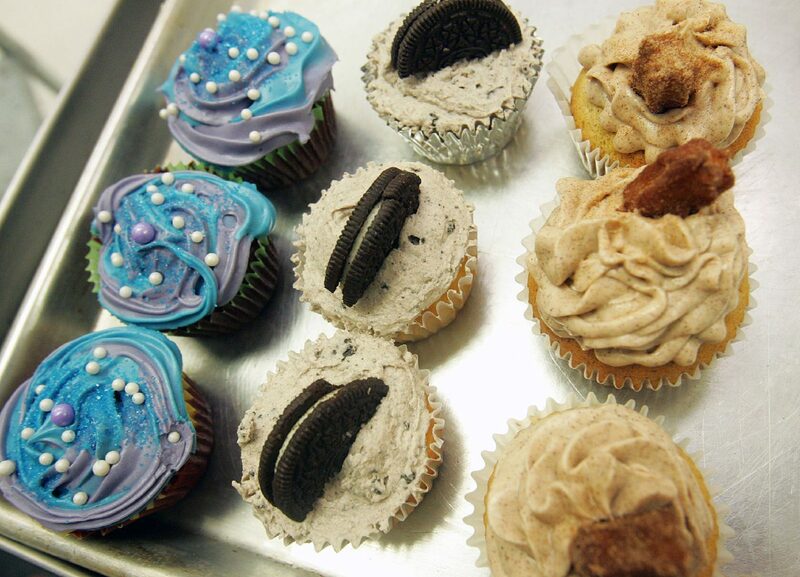 EDINBURG — After learning about baking, students here put their skills to the test in a cupcake competition Wednesday afternoon at the Career and Technical Education Center at Barrientes Middle School. 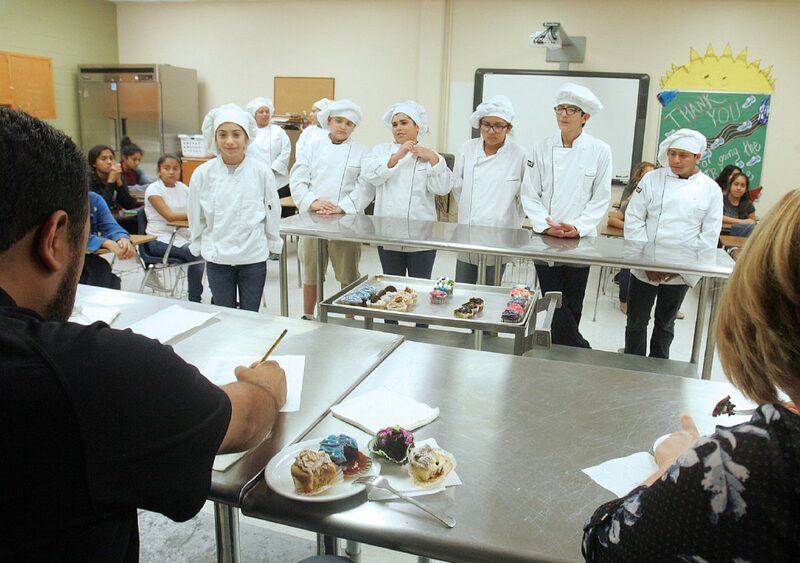 Middle and high school students from the Edinburg school district competed in the first Culinary Arts Cupcake War as part of their fourth-year Summer Enrichment Program. During the three-week course, the students learn the basics, from handling kitchen appliances to learning how to handle culinary tools like knives, but when it came to this competition, they were free-ranging in what to create and bake. 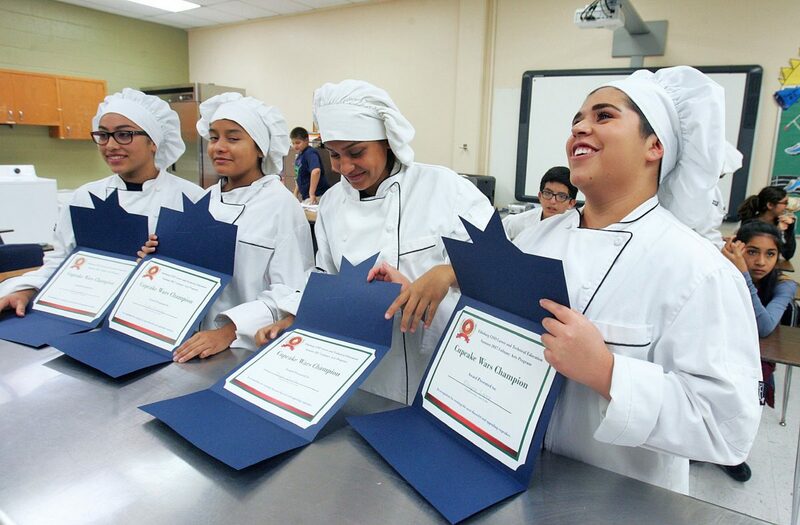 Tephanie Cadena, Edinburg North High School culinary arts teacher said that she’s been teaching in the Summer Enrichment Program for three years and teaching these students has been fun and fulfilling. Edinburg CISD Culinary Arts students cupcakes are judged as they compete in the Cupcake Wars contest as part of the Career and Technical Education (CTE) Summer Enrichment Program in the Career Center Building at Barrientes Middle School June 21, 2017 in Pharr. Cupcakes lay on a baking tray ready to be judged as Edinburg CISD Culinary Arts students compete in the Cupcake Wars contest as part of the Career and Technical Education (CTE) Summer Enrichment Program in the Career Center Building at Barrientes Middle SchoolJune 21, 2017 in Pharr. 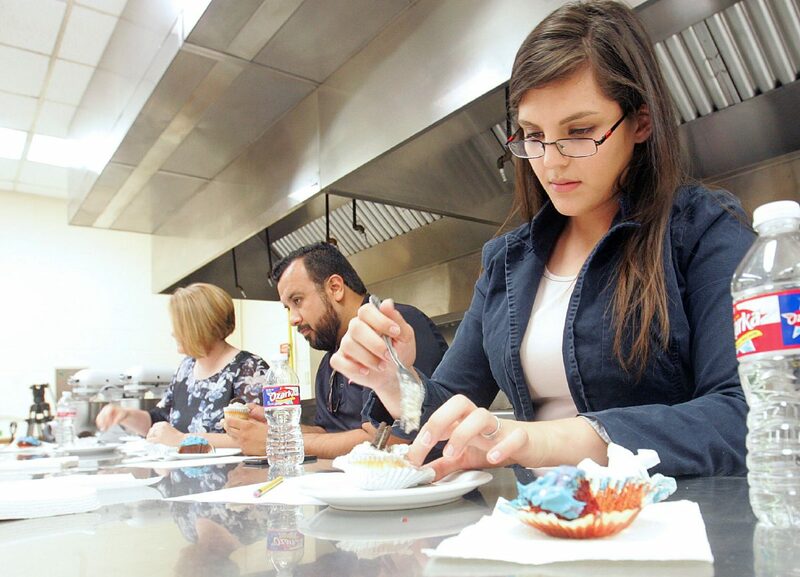 Carina Segovia, right, takes time judging a cupcake as Edinburg CISD Culinary Arts students compete in the Cupcake Wars contest as part of the Career and Technical Education (CTE) Summer Enrichment Program in the Career Center Building at Barrientes Middle School June 21, 2017 in Pharr. In addition, the students had the option of choosing what type of cupcake they want to make and if they wanted to add any other ingredients. “We guide them if something goes wrong. We will tell them so they can fix it,” Cadena added. Similar to the format of the Food Network show “Cupcake Wars,” the students were divided into six teams for the competition. The teams offered a variety of flavors and toppings besides simple vanilla and white frosting. Teams got creative by adding flavors like chocolate and caramel and the frosting colors of blue, green, and brown with toppings of Oreo cookies, churros, marshmallows and more. The students presented their finished product to the judges who chose the best cupcake. The judges were KVEO News Center 23 reporter Karina Segovia, Valley Town Crier and Edinburg Review Editor Pedro Perez and The Monitor Community Editor Tami Cupples-Hernandez. The chef leaders were nervous, anxious and some even shy in addressing the judges with their cupcake description and answering questions about their ingredients. As for the judging criteria, the three judges were looking for creativity, appearance, taste and texture. After careful deliberation by the judges, the high school girls won with their churro cupcake. Chef leader Eleyna Lopez and team members Faith Melendez, Eva Cerda and Maya Zavala were declared Cupcake War Champions. The churro cupcake had a cream-cheese frosting, caramel in the center with cinnamon-sugar and, of course, the churro as an added touch. The Edinburg school district offers career and technical education elective courses at Barrientes Middle School for the students to learn a trade over the school year and they can continue the courses over the summer.